The program offers music teachers and school administrators informative sessions, inspiring performances, and the opportunity to preview the latest instruments, products and tools relevant to today’s music classrooms. The topics you care about, taught by industry leaders, all in one place. The annual Grand Rally provides thoughtful discussion and inspiring performances for the industry’s salute to music education. The Roomful of Pianos features two nights of symphonic masterworks, performed on the nation's foremost assemblage of pianos. A series of five-minute, lightning-speed segments provide information about innovative music education tools, nonprofit music programs and best practices from the classroom. What are the exhibit hours for The NAMM Show? Can anyone attend The NAMM Foundation events at The NAMM Show? Yes. The NAMM Foundation hosts events specifically for NAMM non-members such as college students majoring in music (GenNext), music educators/school administrators (Music Education Days), and NAMM Foundation partners/nonprofit organizations; anyone with a badge is welcome to attend NAMM Foundation events. If I register and attend The 2018 NAMM Show as a music educator does my badge allow me access to the show floor at the Anaheim Convention Center? Yes. Your badge allows you access to the show floor as well as any events at the Hilton Anaheim, during show hours. I noticed that my badge allows only "limited access" to the trade show. What does "limited access" mean? Your badge allows access to the trade show exhibits all hours, and all days. “Limited access,” means that your badge does not give you access to the exhibit hall before or after show hours. Where do I pick up my badge onsite? Your badge allows NAMM Show access for you only and badges are NOT transferable as they are checked with a government issued ID (passport, driver’s license) at the entrance to the NAMM Show exhibit halls. In addition, all non-member attendees must be 18 years of age or older. You should bring the following with you to The NAMM Show: comfortable shoes, as there as literally “miles” of exhibits; a printed copy of your emailed badge confirmation; and photo identification – this will be required at every entrance. Note: Rolling luggage/handcarts, personal music instruments and any instrument accessories are prohibited at The NAMM Show. Bag check is available at the hotels, but not in the ACC. Can I purchase 'demo' instruments from exhibitors? No. The NAMM Show is a trade-only show held to promote the exchange of information between wholesale buyers and sellers. Retail selling on the show floor is strictly prohibited. While visiting exhibits we ask that you remain aware of the business being conducted between exhibitors (red badges) and buyers (blue badges) and yield accordingly. We will share this information in early fall. 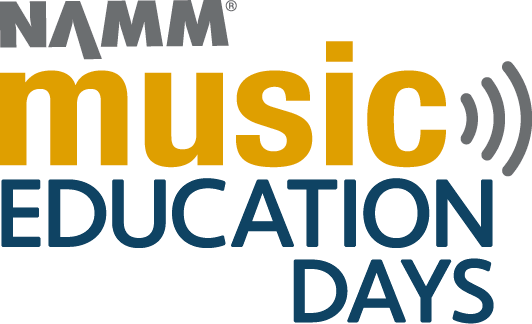 Can I register and purchase a Music Education Days badge onsite? Yes. You are still able to purchase a badge onsite after the badge deadline. The registration fee is $50. For Music Education Days inquiries, please contact Eric Ebel. For housing and registration inquiries, contact Bethany Gilbert. Founded in 2006, The NAMM Foundation represents the generosity and philanthropy of the music products industry. Its mission is to advance active participation in music making across the lifespan by supporting scientific research, philanthropic giving and public service programs.